Well, here we are, back at Table Bay Hotel in the shadow of the giant mountain right behind the waterfront, on a bright and sunny day with just a gentle sea breeze swaying the palm trees that surround the cars at the front of the hotel. It has been harder, and tougher, than anyone could have imagined – including organisers. Late rains left the roads far from the ideal that was discovered on the various route surveys. 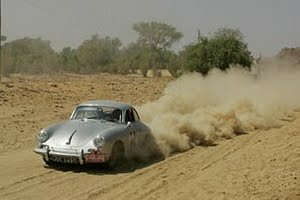 By the end of the 23 days of the event, just about all the cars were suffering the rigours of the giant circuit of southern Africa. Paul Merryweather has set best times on all the timed-to-the-second test sections, pushed hard by Nicky Porter – so it was a Jaguar versus Mercedes showdown. 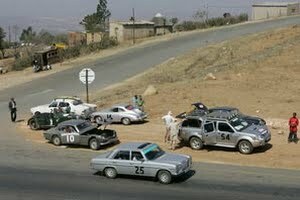 The Merryweathers on by just a single minute, clinching a hat-trick of successes on this event, having set best times on the 1st and 2nd Classic Safari Challenges in a 67 Mercedes SL. The Merryweather’s Jaguar had all sorts of dramas, radiator, fan, waterpump, differential carrier, requiring regular emergency repairs in local workshops each evening. Nicky Porter’s Merc looked serene in comparison, the single-cam 230 taxi engine feeling quite a home in Africa. Nicky came for a “gentle bit of holiday seeing the sights and the animals” but admitted whenever faced with a timed section, and a Jaguar that looked fit to explode into a zillion bits at any moment, he couldn’t resist growing horns as big as the local antelope. Rudi Freidrichs suffered the most when the front offside wheel fell off his Alvis due to the hammering over the final sections – metal fatigue from the Peking to Paris taking its toll in this remarkably rapid car. Undaunted, he went away to a nearby museum, fixed the car and returned two days later. He collected a True Grit Award at the prizegiving. The events winners of the various Categories are on the final results list along with other placings. We left our tiny lodge buried in the centre of the giant Kruger National Game Park – some of us saw spotted hyena, rhino, lots of zebras, various antelope-looking things and Paul Merryweather inadvertently reduced the rare species listing by one when he slammed his cabin door on a cobra. We drove across Swaziland stopping off for a spot of lunch at the Royal Swazi Sun Hotel, before ending up in Phinda where the event was split across two remote lodges. From here we enjoyed a day off ending with an evening barbecue out in the bush lit by hurricane lanterns and then struck out for Zulu country. We spent an hour for lunch at a mountainside lodge overlooking the Isandlwana battlefield, scene of the biggest single defeat in the whole history of the British Army, and then drove on for an hour at Rorke’s Drift, where nothing much has changed (apart from the rebuild) since the bunch of 115 wounded, store keepers, medics and misfits incapable of firing a gun took on the siege by 4,500 Zulus, and emerged next day as the surprise winners. 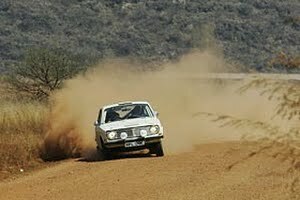 There were two Medal Sections, one before and one after the Rorke’s Drift visit, and the first was very twisty, mostly downhill with wicked adverse-cambers on a hard clay and dusty dirt surface. Notable performances were from Michael and Jenny Barnes in their Porsche 356 (who chalked medal winning drives on both these test sections) as did Nicky Porter and Christine Kerr, in their single-cam Mercedes 230 “taxi”, and top in the 4x4 category were Terry and Janice Ward in their Toyota Landcruiser on the first section and Roger Allen and Maggie Gray in their locally registered pick-up on the second. Today has been a day off, with the whole rally resting in the aptly named Cathedral Peak, high in the glorious Drakensberg Mountains, the stunning scenery certainly impresses. Some have disappeared for a spot of golf, or taking in a mountain walk. The car park has seen some frenzied activity from the likes of Andy Inskip, Chris Bruce, Richard Pybus and Simon Ayris who run the sweeper mobile workshops, the Jensen CV8 of Richard and Karen Auchincloss which continues to sound glorious has had a petrol tank leak plugged, and the Aston of David Spurling has had more running repairs. 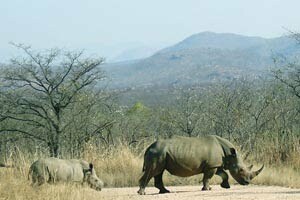 The rally has arrived in the centre of the massive Kruger Game Park; we are now heading slowly south and back in South Africa. We are enjoying a day off in a large thatched lodge, each crew has their own thatched bungalow around a central building that is perched on the side of a cliff, overlooking the Crocodile River, which lives up to its name with numerous crocs cruising the currents, with large Kudu, Zebra, and the odd Elephant nervously sampling the waters. Yesterday saw another Section, with best performance being set up on a long dusty trail by Jose and Maria Romao de Sousa in their Volvo 142S, that was originally built for Tony Fall to drive on a long distance rally in South America, going well now it’s had an axle overhaul. Casualty here, however, was car number one, the Vintage Bentley of Tony and Karen Sinclair which limped in late last night with rear axle seizure. 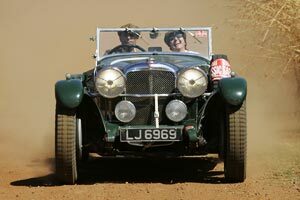 Best vintage car on the Medal Section was the Alvis of Rudi and Helga Friedrichs, other good performances were put up by the Merrweather’s Jaguar S-Type, now with a new radiator found locally, and the Derby Bentley of Michael Hurdle and Barbara Harris. David and Margaret Miller were going well in their ’77 MGB GT having overcome a bout of broken front bump stops early on. To get to this spot we have travelled from Victoria Falls south across Botswana, leaving Botswana by a rickety narrow bridge over the great, green, greasy Limpopo River to the border confusingly called Zanzibar but of course nothing to do with the spice island in the Indian Ocean off Tanzania. The air is bright and sunny but nothing like as scorching hot as we all experienced in northern Namibia. Yesterday’s run set out from Agatha, high in the Drakensburg Mountains, a wonderful old-world colonial-style hotel, the comforts of which have gone down as a highlight of the entire journey. Cutting our way through dramatic gorges and rocky canyons out of the Mountains to the Kruger Game Park provided a day with constantly changing views and variety. Tomorrow’s run takes in lunch in Swaziland, before an overnight halt at Phinda on the edge of the St. Lucia Wetlands, a world heritage site. Running repairs today include attention to the Jensen CV8, of Richard and Karen Auchinchloss which was running strongly yesterday, and the Derby Bentley is having its rear bumper bolted back on – apart from that its a lazy day chilling out before the action to come. We have just spotted David Spurling operating a long tube of a vacuum cleaner, taking up half a ton of dust from the inside of the Aston Martin DB5 Convertible – as his wife Trish says this is the first time she has seen him operate a Hoover, it just goes to show how life-changing it can be when you take part in a long distance rally. WE have just returned from an early morning game-drive in the remarkable Chobe National Park, a few miles up stream from Victoria Falls, very much in the heart of Africa. We saw a family of three large, rolling in sand, hippos, buffalo, several elephants greeting us by crossing the road, just prior to spotting a cheetah in the scrub, a rare sight. To get this far has been a dramatic run. We set out of Cape Town, heading north, with a timed drive through the Cederberg Mountains, a narrow dusty dirt track that threaded along a valley floor shielded by high peaks for nearly 100 kms. Recent rain meant the dirt was corrugated in places and rougher than the original route survey. 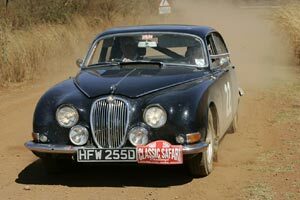 The two Jaguar XK120s chose a cautious pace, others pushed on, with the best times being chalked up on the Medal Sections by Michael Hurdle and Barbara Harris in their Derby Bentley, Nigel and Christine Gray in their Sunbeam Tiger and Michael and Anne Wilkinson in the 1968 V8 Holden HK. After stopping at Clanwilliam, the rally then headed up the long empty road to the border of Namibia, for our stop at Cannon Lodge Village near the spectacular Fish River Canyon. Miles of empty dirt road ran under our wheels to this point. We then pushed on to Helmeringhausen for a spot of lunch in this one-street town, before another Medal Section of 50 kms through stunning scenery, which saw Rudi and Helga Friedrichs in their Alvis Speed 20, Richard and Karen Auchincloss in the Jensen CV8 and Paul and Sandra Merryweather in their Jaguar S Type collect trophies for best efforts in their respective classes. An early morning departure to take in the world’s highest sand dunes was next up, and then the rally pushed on to south of the Skeleton Coast for Swakopmund, crossing the Tropic of Capricorn, taking in a further Medal Section, 70 kms of sweeping gravel roads, ending up in the town’s converted railway station – the restaurant is Platform One. Winners of the day were once again Rudi and Helga, Nigel and Christine and Paul and Sandra. The rally headed into wild and empty desert that looked ideal for a Wild West film set to stay under the thatched roofs of Twyfelfontein, set against rich red rocks where mankind first walked umpteen thousand years ago and left his mark with rare rock paintings in nearby caves. We left here for a hillclimb of 20 kms over the Grootberg Pass, winners here were Anthony and Karen Sinclair in their vintage Bentley 4½, Margo and George in the Volvo 122S and Michael and Anne in the Holden HK on our way to the overnight halt under canvas at Anderson’s Camp with Rhino and Lion feet away from our dinner tables out on the verandah at sun set, as animals overcame their fears to sample the muddy watering hole while we all enjoyed a bottle of wine or three. 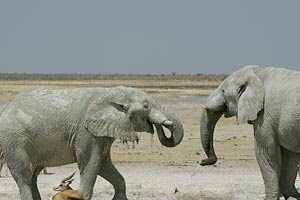 This was followed by free-day of touring through the Etosha Game Reserve on our way to Mokuti Lodge and the thatched wooden chalets of our overnight stop, before setting out for Poppa Falls on the outskirts of the vast Okavango Delta. This led us to the border of Botswana, the countryside changing dramatically, the roads becoming more busy after thumping down the empty stretch of Caprivi Strip to the border, saying goodbye to the wonderful delights of Namibia with a crossing into the Chobe National Park and an overnight halt at Kasane. It’s a day off today, a chance to catch up on the laundry, a number of crews have taken a boat down river to Victoria Falls, and in the car park Andy Inskip with Chris Bruce is attending to running repairs, with Simon Ayris and Richard Pybus taking over for the afternoon shift. The food and wine has been good here, as we chill out by the pool bracing ourselves for the longest day of the event of 600 kms of tarmac to Selebi Phikwe tomorrow.